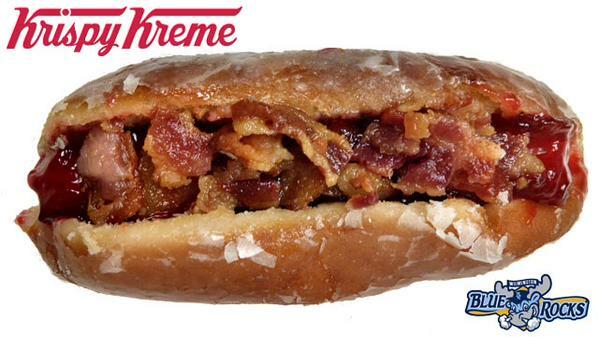 Unholy Alliance Of Food Items krispy kreme delaware Blue Rocks minor league baseball KC Royals hot dog! Although the hot dog-doughnut hybrid doesn’t look very appetizing, one person who tried it shared a positive reaction. Not exactly pleased with the current name for the meal, the Blue Rocks – Class A affiliate of the Kansas City Royals – are hosting a Name That Doughnut contest. Among the contest prizes? Fifty dollars in BlueRockBucks to be used to buy the Donut Dog, the Wichita Eagle reports. No word on how much the dogs cost or if any of those Bucks can be used for other concession stand treats.